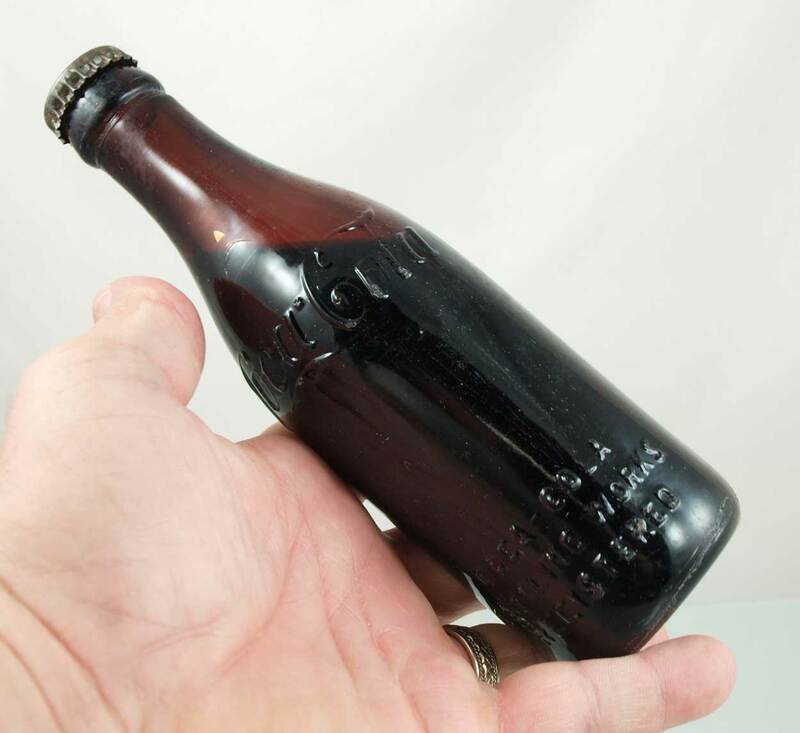 Description: Super Rare Amber Coca Cola Bottle - Still Filled and Capped - Lexington, KY - Here is a VERY Nice Amber Coca-Cola Bottle that is marked "Lexington, Kentucky". This is a VERY RARE "Machine Made Bottle" ( you can tell because the side seams run all the way to the cap.) From what I understand they were ONLY made for a year or so! It was recovered recently while cleaning out an old barn in Fayette County, in Central Kentucky! Here's the really RARE part, .... it is STILL filled and capped! This is the very 1st one that I have came across. I have talked to several bottle diggers and collectors and they had never saw one still filled either. Coca- Cola is embossed on the Shoulder on both sides and on the bottom. (see photos) At the bottom, one side has embossed "COCA-COLA BOTTLING WORKS REGISTERED" and the other side has embossed, "LEXINGTON, KY." The cap is printed with "Coca-Cola" and then in small print "REG U S PA OFF". Also around the rim of the cap is printed in small print "Bottle By Coca Cola Bottling Works Of Lexington, KY" and under that in very small print "CCS". The Bottle Looks great and has a lot of sheen and very little signs of case wear. All I have done to it since I acquired it is to wipe it off with a damp cloth. I have taken several photos so that you may judge the condition yourself! Feel free to ask questions! I have been into Antiques and Collectibles for many years and know that this is a Really Rare find...... A super addition to Any Collection! Description: RARE - Amber Coca-Cola Bottle! 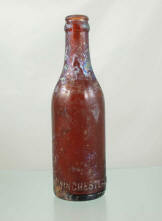 Winchester, KY - Here is a Nice Amber Coca-Cola Bottle that is marked "Winchester, KY". I recovered while digging a circa 1900-1910 dump in Fayette County, in Central Kentucky several years ago. "Coca- Cola" is embossed near the bottom on one side and "WINCHESTER, KY" on the other side . (see photos) This nice Bottle is dark honey in color. There are no chips or cracks and the lip is in very nice shape. The Bottle looks nice and has a some sheen and little case wear. I washed this bottle inside and out after recovery and have done nothing else as you can see in the photos. It would be a nice one to have tumbled to clean! I have taken several photos so that you may judge the condition yourself! Feel free to ask questions. I have been into Antiques and Collectibles for many years and we strive to provide good photos and describe our listings in detail. *** UPDATE *** This Bottle is also lightly embossed TWICE on the bottom with what looks like " D.O.C 19 __ " The last digits I can not make out, but there is something there.